Sometimes it’s about the planning. Other times it involves the store’s layout. It may even come down to how hungry you are when you leave the house. In any case, there are plenty of ways to overspend when you shop for food. But there’s good news! When you plan out your trip and know the supermarket’s strategy, you keep your spending in check. That’s very empowering when you’re beginning to take control of your money. Are you ready to feel that power? Then read our top 10 tips to keep from overspending the next time you head out to get groceries. 1. Shop around the same time each week. If you stick to a regular schedule instead of waiting too long, you won’t overspend to restock a bare cupboard. On shopping day, give yourself plenty of time to shop rather than trying to cram the trip into a busy day and grabbing too many unnecessary items off the shelf. Make a list of your meals for the week and the groceries you need. Then shop away. 2. Snack before you shop. When you walk into a grocery store with your stomach growling, even the handles on the freezer doors can look tasty. You might start tossing snacks in your cart and overspend on a bunch of food you didn’t budget for. You can stop this from happening by simply having a meal or snack before you leave the house. 3. Map out the store. You’re probably familiar with your store’s layout. 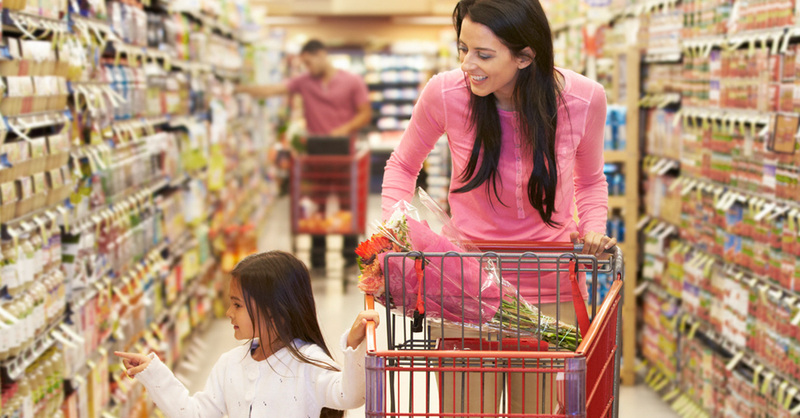 As you make your shopping list, do a mental walkthrough and list your items by aisle. That keeps you from straying and being tempted to buy unneeded items. It can also speed up the trip! 4. Go solo shopping. If you shop with a spouse or friend, you might talk yourselves into purchasing something you wouldn’t have even considered if you were by yourself. When you’re alone, you can just zip in, buy things, and zip out. 5. Choose smaller carts. Research shows when you’re pushing an empty shopping cart, you feel compelled to fill it—which means you buy more than you need. If you don’t have a big grocery list, then carry a basket around the store instead. 6. Beware of the bakery. Unless you plan to buy cookies or cakes, stay away from the bakery. Don’t be tempted by the sweet smell of bread. Sticking to your list is much sweeter. 7. Look out for lights. Some stores have sensors in the aisles of the frozen food section. When you walk past, the freezer lights turn on, drawing your attention to the pizzas, veggies and pre-packaged dinners. Expect this when you approach that part of the store, and don’t let the freezer light show distract you from your grocery mission. 8. Sample with caution. When those sample tables at the ends of the aisles try to lure you in with cheese cubes, fruit drinks or tasty treats, just remember, the fewer samples you take, the better. You don’t want to linger too long and be talked into buying food that’s not on your list. Stay in the shopping zone with a simple “no thank you” or eat your sample on the go. If you enjoy it, put it on your list for the next grocery run. 9. Look at the price per ounce. When comparing different brands or container sizes, look at the price-per-ounce displays on the shelf tag. That helps you determine the best value, and those savings add up over time. 10. Don’t check out the checkout aisle. Business Insider reports that the checkout line is the most profitable area of the store. With all the candy bars and magazines on the rack, it’s not hard to see why. Make a mental note to end the shopping before you get to the checkout aisle. Simply face the cashier instead of the tabloids and bubble gum. It’s amazing how budgeting and making a plan gives you control over your money—not just with grocery shopping, but also with all your household spending and saving. Be intentional, map it out, and get it done. Those are the oldest tricks in the book. And they work. Keep up with your grocery budget with a free EveryDollar account. Set how much you want to spend and track it throughout the month to help keep yourself from overspending.